This thesis work presents the results of experimental studies on the gas transport properties of three polymer-based membrane systems: (i) amine-modified epoxy resins, (ii) epoxy resin nanocomposites containing Few Layer Graphene (FLG) nanoplatelets as dispersed fillers and (iii) nanocellulose-based membranes. 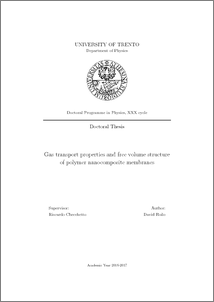 The gas transport properties of the present membrane systems were studied by gas phase permeation techniques changing sample temperature and penetrant molecules; results were discussed in the framework of the free volume theory of diffusion, using information on the samples’ free volume structure as experimentally obtained by Positron Annihilation Lifetime Spectroscopy (PALS). Results evidenced that the transport properties of small penetrant molecules are controlled by the membranes’ free volume structure, which determines, in fact, the penetrant diffusion kinetics. The free volume of epoxy resins was changed by changing their crosslink density but maintaining same chemical environment for penetrant molecules: it was observed that, reducing the free volume structure, the gas diffusivity decreases but no relevant changes in the gas solubility occurred. The experimentally obtained fractional free volume values permitted to reproduce the measured diffusivity values and their variation with temperature, using equations provided by the free volume theory of diffusion. Increasing the amount of FLG fillers in epoxy-based nanocomposites, we observed a progressive gas permeability decrease, which was accompanied by a progressive reduction of their free volume. This correlation was attributed to the formation of constrained, gas-impermeable polymer regions at the filler-matrix interfaces. The thickness of these regions was evaluated by the reduction of the nanocomposites’ fractional free volume with respect to the free volume of the pure polymer matrix; its value permits to reproduce quantitatively the experimental permeation data of the nanocomposites at all examined temperatures, filler concentrations and test gases. Few micrometers thick nanocellulose films deposited on polylactic acid substrates act as impermeable barriers for CO2, O2, and N2 and reduce the D2 (deuterium) and He permeation flux by a factor of approx. 10^3. Penetrant transport through this biopolymer is controlled by the solution-diffusion mechanism and barrier properties are due to the extremely low penetrant diffusivity. The free volume in the nanocellulose coatings consists of interconnected elongated cavities with sub-nanometer cross-sectional size where the selective transport of the small size penetrants is due to sieving effects. D2 and He diffusion has thermally activated character and occurs in configurational regime.